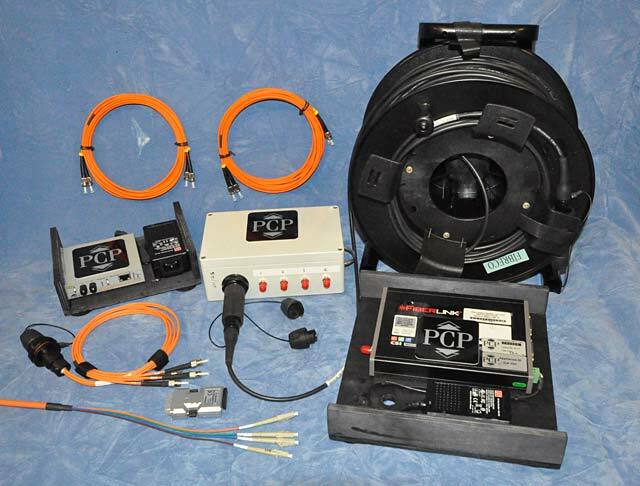 PCPtechnical has sophisticated yet compact rigs and some unusual items that provide unique solutions. Very little equipment is hired in enabling tight quality control. 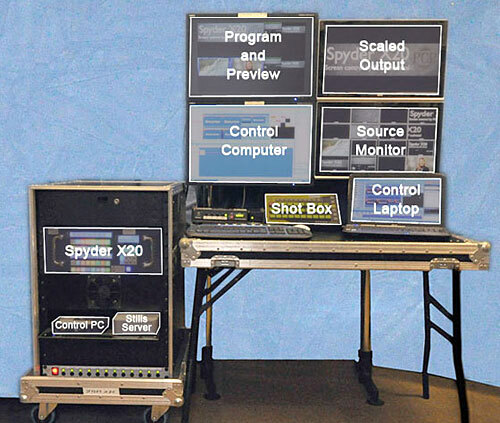 The Spyder X20 comes with two control computers, a dedicated ShotBox, a Stills Server and monitors. 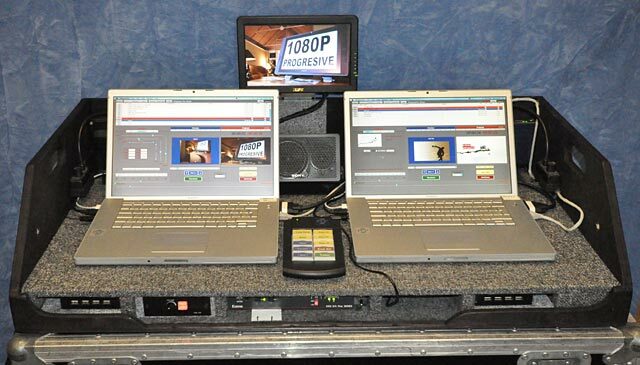 The wireless laptop can be taken in front of the screen enabling the operator to fine tune settings, blends and projectors while seeing the actual projected images. 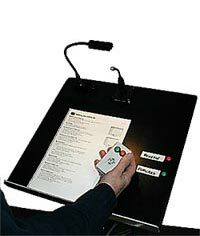 This is ideal for live events as the names clearly displayed on the buttons reduce the chances of errors. 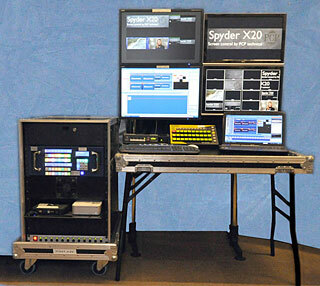 With 9 pages that's over 200 commands that can be anything the Spyder X20 has been set up to do! The MacPro rack contains two computers that can run Keynote as a Mac or PowerPoint as a PC. Both have an operators screen, dual output cards and a separate internal disc for data. The optical audio signal is converted to balanced XLR outputs as well as going to internal monitoring speakers for the operator. Using the optical output provides the best sound quality possible. 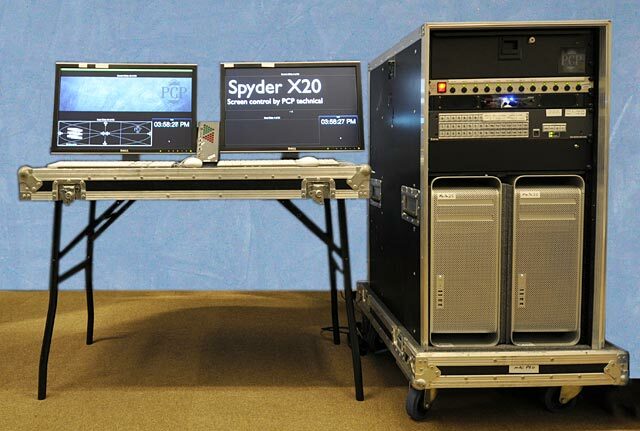 Playback Pro is the recognised system for video replay. It can play most file formats and offers geometric trimming and level adjustments for each clip. The tray has a main machine and a backup and the selected signal is then da'd to the internal monitor as well as multiple outputs. 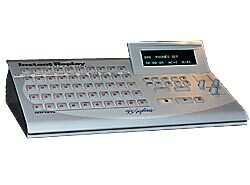 There is a dedicated control keypad for the operator. The optical audio signal is converted to balanced XLR outputs as well as going to an internal monitoring speaker for the operator. Using the optical output provides the best sound quality possible. Clean power is essential for technical equipment, and this is best achieved with a UPS : Uninterruptable Power Supply. This is basically a big battery that is charged by the local mains, which then generates 'clean' mains. Should the power supply fail, this will continue to provide power for about 10 mins which is ample time to restore power or shut down correctly. Control equipment is always protected by a UPS. 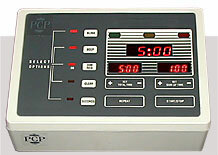 The VN-Matrix system is used to send digital signals over IP. This can be over a single cable, fibre, or by using the internet to anywhere in the world. By creating a VPN over the internet a show relay was sent from a congress at the ICC in Birmingham to a client's offices in central London. Fibre Optic signals are immune to external interference and the multi mode transmitters can send signals over hundreds of metres. A venue's internal fibre optic patch system can often be used to get signals from control at the side of the stage to the projection room. The Tactical Fibre system with it's ruggedised connectors provide ideal on site signal distribution and the drums can be joined for extra length with breaks at convenient places. Media convertors can extend 100Mb networks over fibre optic for the VN-Matrix system. 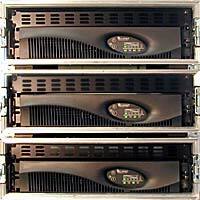 The two main sound racks are easily transported and quickly assembled on site. - Six tie-clip and three hand-held radio mics. 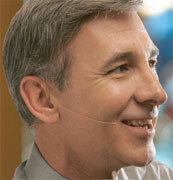 - Four wired mics for lecterns & tables. - A feedback exterminator, compressor, delay and graphic equaliser. For larger events additional amplifiers and speakers can be added. This is a sound system that fits entirely in one road trunk with room to spare. Four tie clip and two hand held radio mics. Four hard wired mics for lecterns & tables. A CD for music source, and a cassette for recording the event. Additional mixer inputs for mics, video and computer sources. A feedback exterminator, compressor, graphic equaliser, delay and amplifier. The rear pair of the four small loudspeakers are delayed to improve clarity. This rig is ideal for smaller events. Self powered bass cabinets can be added should better music reproduction be required. Four additional matching speakers and amplifiers can be added to the system to provide a simple PA for a substantial area. 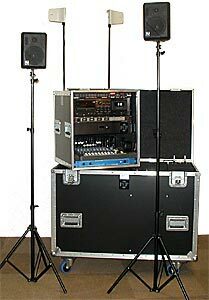 Speakers can be mounted on tripod stands, tall doubling stands or cable tied to curtain tracks etc as they are quite small. 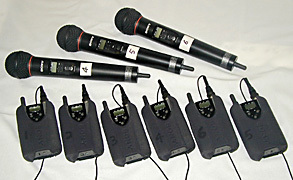 There is a selection of hand-held, tie-clip and headset radio mics. All the radio mics are 'diversity' which means that they use two aerials and choose the better of the two signals, dramatically reducing the chances of drop outs. All the radio mics are either on de-regulated frequencies or are licensed for use in the UK and Europe. 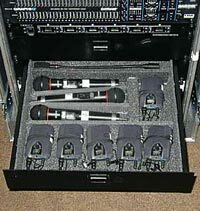 Six-way expansion racks permit a further six channels to be easily added to the standard racks. These headset mics are unbelievably light and unobtrusive. They provide a higher signal level than a hand held radio mic so significantly increase the possible volume before feedback. These are the ideal solution for relaxed and informal presentations. These amazing machines can contain up to 1000 'cuts' of music totalling 24 hours. The 50 buttons are 'hot start' for whichever cut is assigned to them. When a button is pressed, the assigned sound starts INSTANTLY and jumping between cuts is instantaneous. This equipment is ideal for awards and similar events requiring quick responses and is a useful 'library' to have on site. It is in many ways preferable to a laptop as it is always ready, so when you press the button you get what you expect every time. 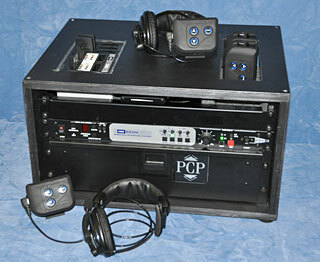 PCP technical has a range of audio mixers up to a 32 channel Midas Venice. Both the 16 and 32 channel Venice mixers have had their auxiliary inputs converted from Pre Fade to Post Fade to be more suitable for live events. A free-flowing live debate always causes the sound engineer problems. When the presenters have radio mics and don't sit where expected these problems can become unmanageable, with sentences and interjections missed. Leaving all mics 'live' can result in feedback. PCP technical solves this problem by using Automatic Mic Mixers. No words are missed. Even quick comments by another panel member are 'caught'. 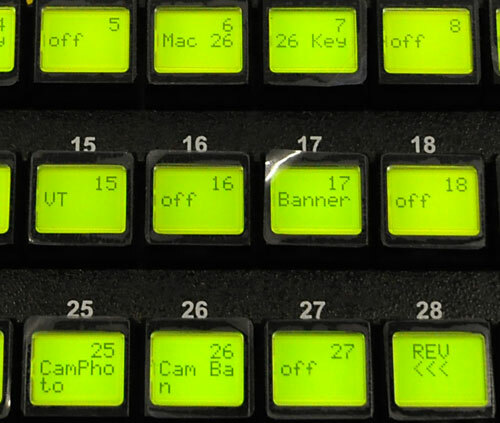 The units are clever enough to 'mix' more than one channel at a time, and there is a 'chairman's button' so all mics apart from one can be cut should the discussion need to be brought under control by the chairman. The standard processor is the Sabine feedback exterminator which constantly monitors the sound to prevent feedback. These processors work in the same way as a good sound engineer located with mixing desk and outboard equipment in the perfect place in the room. As the crew are often 'tucked away' in a corner, behind the set or even in another room these can be invaluable pieces of equipment. These units have a graphics equaliser, parametric equaliser, compressor and delay. Sabine processors are standard in all the racks. The audio delay line is used to time-align the signal from multiple lines of speakers. Without this the sound arrives at the audience at different times, sounding 'woolly'. Audio recording onto a Compact Flash card enables files to be emailed or burnt to CD. 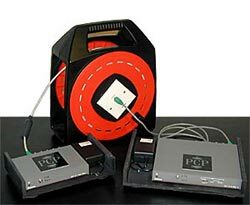 PCP technical has a large stock of ASL wired comms with single and binaural headsets. 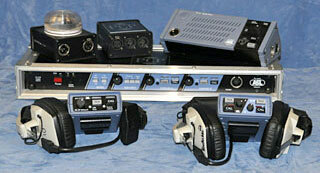 Binaural comms are ideal for the vision mixer operator with one channel for show and the other for cameras. 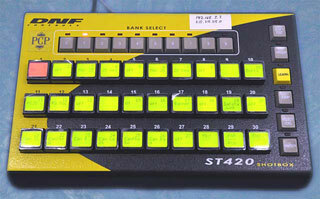 There are various flashing call lights, signal splitters and squawk boxes. Two nice features of the ASL system are a loud call buzzer at each beltpack that can be muted during a show at the master station and all mics can be cleared from the master station - ideal when someone puts a headset down near a source of noise without turning the mic off ! The four wireless units can be used on their own circuit or added onto a wired circuit. Range and battery life are excellent, and it is hard to tell who is on wired and who is on wireless headsets. Compact speakers: these minute speakers can be built into lecterns and trib desks for fold back. For speech only with very little range. Self powered speakers: these are small speakers with an amplifier built in. Typically used for a graphics or prompt operator to hear the presenter without having to listen to comms that can have too much 'chat' for them to concentrate. EV S-40's: these compact loudspeakers are excellent for voice and are standard with the small sound rack. Small enough to be mounted in awkward places such as curtain tracks with cable ties. 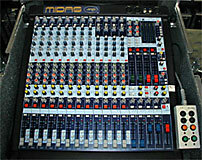 Used for presenter fold back, stage fills and Tannoy rigs. Nexo PS-8's: This is a compact yet incredibly powerful system with good distance coverage. Two full range cabinets mounted on one bass cabinet per side is a normal rig. This can be supplemented by the same again or just two single speakers on tripods as a delayed line. Each speaker comes with hanging brackets. Distributing analogue video signals is done in two ways : conventional wire and CAT-5. Using special transmitters a video or data signal is sent down a Cat-5 cable to receivers where it is decoded with no loss of quality over distances up to 300m. 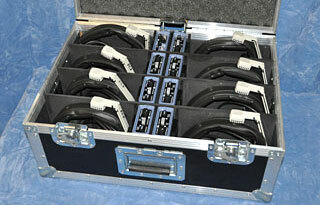 It can also be used with many venue patch bays. The cable is sufficiently cheap that it can be regarded as disposable: it is useful for long cable runs over roofs etc and can be cut, terminated and joined easily. CAT-5 saves a lot of time, space and weight compared to conventional cable. 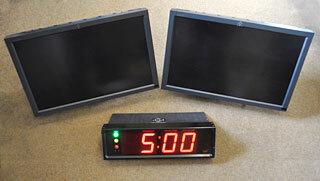 Confidence monitors provide the presenter with an easy-to-read and reassuring view of the on-screen support material. Confidence monitors can be used in may different ways. For smaller events they can have exactly the same image as that on the main screen. At larger events this could include live camera which can be disconcerting in which case only the speaker support material is shown. Other images such as prompting, notes, current image, next image, current & next image can be shown - with a combination if necessary. In the picture below prompt can be projected onto the walls at the back of the audience and graphics can be shown on the floor monitors. For presenters without prompt graphics can be shown on the wall and the monitors. 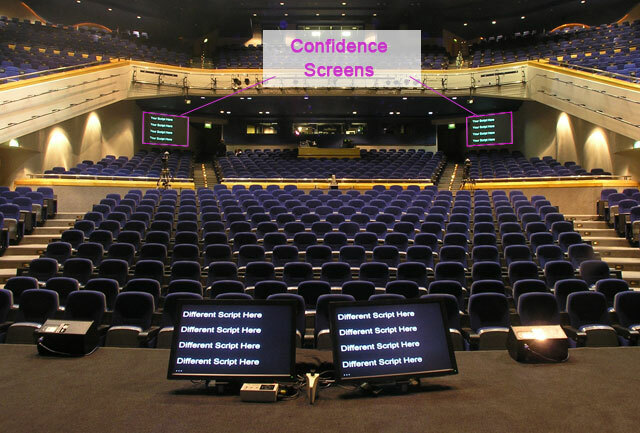 Prompt on the rear wall is at the correct height for the presenter's eye line, prompt on the floor monitors encourages the presenters to look down - not good for the eye line with audience and cameras. 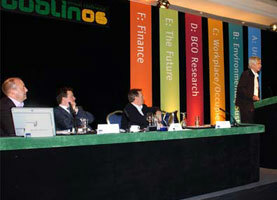 A digital display shows presenters how much time remains, with green, amber and red "Traffic Lights" and an audible "beep" if necessary. 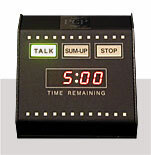 Total time and sum-up time can be adjusted for each presenter. There are displays that can be built into lecterns, freestanding on tables, or floor mounted. Wireless hand-held units and cue buttons on the lecterns provide direct control of forward and reverse in PowerPoint and Keynote. A local stage receiver minimises the chance of a missed cue. Used in conjunction with confidence monitors the presenter has the advantages of direct control without the disadvantages of having the computer on the lectern. The system can be switched to manual by the crew, to take control from the presenter, reverting to a traditional cue light system. This is particularly useful at speaker change-overs when the crew have to load the next presentation. This system can be expanded to have a number of wired and wireless buttons over considerable distances. This is a tried and trusted system that is popular with presenters since it's simple, reliable and there is no delay. 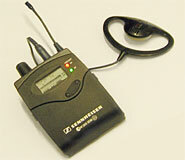 A stereo transmitter with headsets enabling the user to hear left, right or a mix of the two channels. 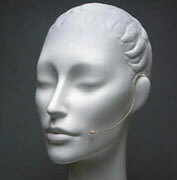 There are various in earpieces depending on the application to provide a comfortable fit for presenters. Often used for professional presenters on stage and by surgeons in operating theatres, these light, convenient headsets are the perfect ear-worn monitor.